Welcome to my dedication to commemorate the twelve men lost when Whitby Lifeboat capsized in the 1861 lifeboat disaster in one of the region’s worst lifeboat disasters. My wife and I were amongst around 100 people attended a short service of commemoration and remembrance at Whitby RNLI lifeboat station on the 150th anniversary of the lifeboat disaster. During a great storm on 9 February 1861, The lifeboat men had been attempting to rescue sailors from a stricken collier called the Merchant and had put the lifeboat to sea for the sixth time that day. Whitby's lifeboat capsized with the loss of all but one of the crew, Henry Freeman. Henry Freeman, was on his first lifeboat launch and is thought to have survived because he was the only man wearing the new design of cork lifejacket. Freeman was awarded an RNLI Silver Medal for his part in the incident and went on to become one of Whitby's most renowned lifeboatmen during more than 20 years as the Whitby RNLI Coxswain. 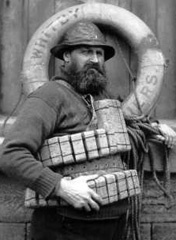 Skipper John Storr, who was to die with his son, tossed Mr Freeman, as the youngest member of the crew, a new fangled life vest that had been sent as a sample to Whitby Lifeboat Association by the RNLI in an attempt to persuade stubborn local rescue stations that better equipment could be provided by a national body. The short act of remembrance was held at the station before the all weather lifeboat George and Mary Webb and the restored 1909 Upgang William Riley launched taking with them descendants of some of those who died. The boats made there way close to the spot where the lifeboat capsized. On the day of the first service the weather was dry but overcast, thankfully though it remained dry and the commemoration passed off peacefully with a large attendance. After a short prayer an anchor cross of flowers, was lowered into the sea, whilst a single white rose was also dropped into the sea for each lifeboat man who had drowned as their names were read out. Those on the William Riley also placed their own tribute of flowers into sea. The boats then returned to the safe confines of the harbour and the lifeboat station for a chance to look around, tea and cakes were gracefully served by members of The Friends of Whitby lifeboat station (FOWL). 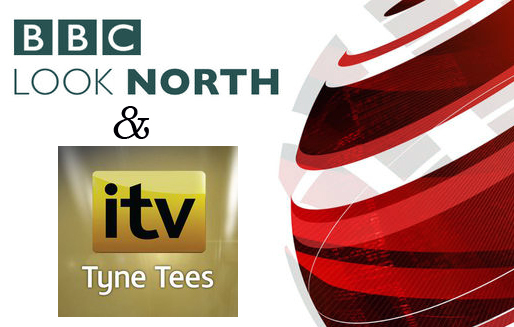 I have added the service outside the station which was broadcast by BBC Tees Radio as well video news footage from both the BBC and ITV news programs. Click on the link below to download the news footage to your computer. I have just added two gallery pages to the website the first of which includes photographs captured by Ceri Oakes, the Gazette staff photographer of the small service held at the lifeboat station whilst the second is the larger church service. You may also like the more detailed report about the tragedy and the commemoration on the Real Whitby website. I have also uploaded a copy of the Yorkshire Post page related to the 1861 Lifeboat Disaster.